AL CASTELL HEM DISFRUTAT DE LA LLEGENDA DE SANT JORDI. HA ESTAT MOLT DIVERTIT. PIM, PAM, PUM CONTES. 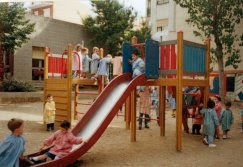 TEATRE A L'ESCOLA. EN JOAN ENS HA EXPLICAT MOLTS CONTES I TAMBÉ HA FET MÀGIA. UNA EXPLOSIÓ DE BONA MÚSICA, RITME I COLOR. LA MONA A P5-A. SOM PETER PAN!! FEM LA MONA A P5-B. SOM MINIONS! !